Knee pain can be managed with a knee injection, whether it’s a steroid injection for knee pain or a genicular nerve block. Other options include knee injections for arthritis and viscosupplementation injections. By far, a cortisone injection knee treatment is the most common of all the injection for knee pain treatments, but the genicular nerve block knee treatment provides your knee genicular nerve block to stop pain. Make an appointment in our sports injury and pain management clinic in NYC to get your pain evaluation and treatment. Your knees are tough joints; they cushion your landing when you jump, like in basketball, and they take all the torque when you run, like in soccer. Knees bridge the intersection between the femur in your thigh and the fibula and tibia in your shin. Knees have a complex structure of ligaments and tendons that allow you to bend and stretch your knees. With so many possible causes for your pain, your Midtown Manhattan physician needs to determine exactly what’s wrong with your knee. The diagnosis — arrived at through a physical examination, medical history and, if necessary, additional imaging tests — determines the treatment. But a knee injection can ease the pain and inflammation in your knee. Is a Knee Injection Right for You? Cortisone injection knee treatments help ease knee injuries and soft tissue damage. A steroid injection for knee pain, just like one for your back, kills pain and reduces inflammation in many cases. The effects of the injection last for two or three months, but this isn’t a good treatment for chronic pain. Genicular nerve block knee treatments temporarily block pain in your knee while your body heals. If you’ve had knee surgery, for example, a nerve block stops the nerves in your knee from sending pain messages to your brain. This gives your knee time to heal. Knee injections for arthritis control the pain and inflammation from arthritis symptoms. Rheumatoid arthritis is a painful condition that causes swelling, pain and stiffness in your joints. A corticosteroid injection provides some relief from the pain while it reduces inflammation. 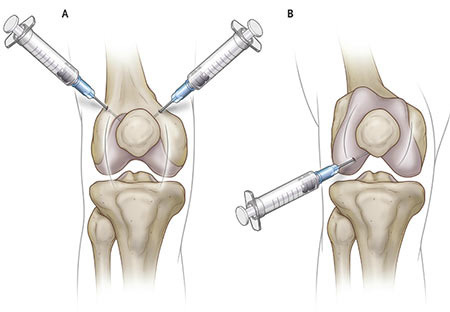 Viscosupplementation injections in your knee reduce the symptoms of osteoarthritis. Instead of steroids, this injection uses a think hyaluronic acid supplement that cushions your knee where the cartilage has been worn away. Whether any of these treatments are right for you is a question only your pain management doctor can answer after reaching your diagnosis. Often, your doctor starts you out with conservative treatment options, like rest, over-the-counter pain relievers and physical therapy. But when these remedies don’t provide the needed reduction in pain, one of these injections for knee pain may be the next step. Surgery, such as partial or total knee replacement, is always the last option, if nothing else worked. You can get same-day knee injections at the Sports and Pain Institute in NY. After your diagnosis is determined and your treatment is decided, you’re made comfortable on an x-ray table. Your doctor relies on fluoroscopic images in real time to guide the needle to the exact spots in your knee that the medicine has to reach. Whether you receive a genicular nerve block knee treatment, knee injections for arthritis, a steroid injection for knee pain or viscosupplementation injections, you have the same procedure. All injections, in fact, contain some local anesthetic to instantly relieve your pain, although the effects of the anesthetic last only a couple hours. After the procedure, you can go home, where you should relax for the rest of the day. Cortisone injection knee risks: Tendons may become weaker, your bones may become thinner and the injection can damage a nerve. Genicular nerve block knee risks: An itchy rash may develop, or in some cases, pain relief isn’t noticeable until a month or more after the injection. Viscosupplementation injections into your knee risks: You may experience Inflammation, stiffness and soreness. It’s also possible the treatment just doesn’t work for you. These risks and side effects are minor compared to the potential benefit of several pain-free months. Talk to your NYC doctor about the risks before deciding to get a knee injection. Do you have any questions about the knee joint injection treatment for hip pain we offer in NYC? 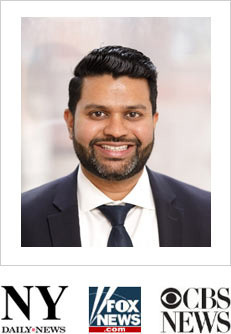 Would you like to schedule an appointment with the best rated knee pain management doctor Febin Melepura MD of sports pain management clinic in New York? Please contact our office for consultation with the pain relief specialist in Midtown Manhattan.